This simple (5-ingredient!) 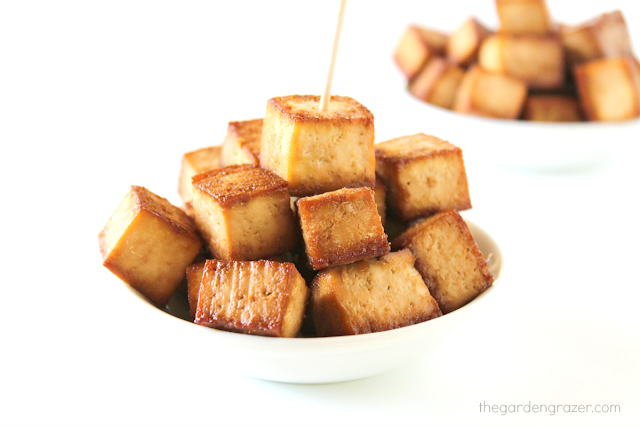 method of marinated baked tofu is so flavorful and super versatile! We love snacking on them hot off the pan but if you can resist eating them fresh out of the oven, they’re awesome in a ton of different ways. 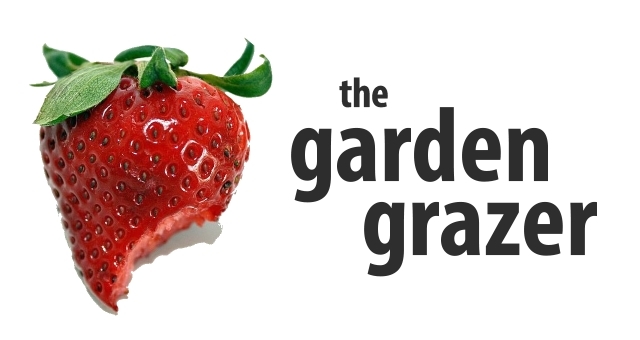 Soup, salad, rice bowls, wraps, appetizers/snacks (either plain or with a dipping sauce), or a simple meal combined with rice/quinoa and veggies. 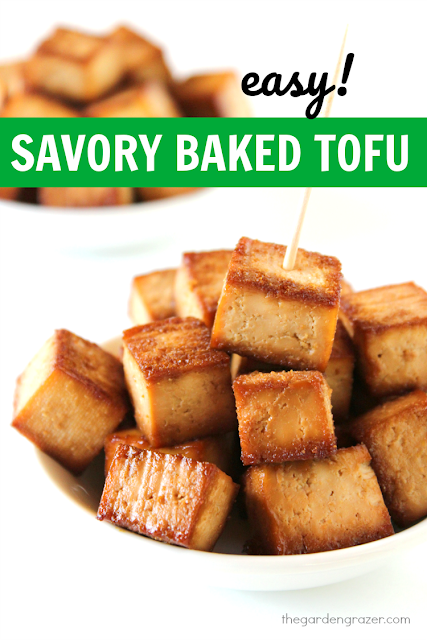 It’s pretty neat how tofu takes on a whole new flavor and texture when baked. Right out of the oven, it’s golden brown, soft and tender – yum! Then as it cools, it becomes a lot more dense which holds up really well in salads, rice bowls, etc. Since tofu is basically a blank palette as far as flavors go, this easy marinade packs a BIG punch of savory flavor that lends itself to a variety of dishes… and of course a tempting snack hot off the pan! Optional: 1 Tbsp. maple syrup – I love this addition! 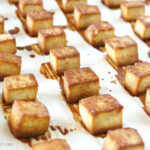 Drain tofu and lightly press to remove excess moisture (I use paper towels). 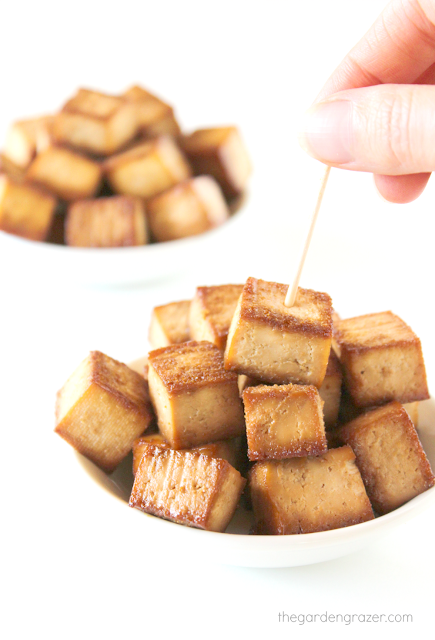 Cut tofu in about 3/4″ thick pieces. Place in a shallow container where they will marinate. In a small bowl, combine tamari, rice vinegar, garlic powder, onion powder, and maple syrup if using. Stir to combine. Pour over tofu and gently toss to thoroughly coat. Bake for about 25-30 minutes, or until edges are golden brown, tossing halfway through. Keeps refrigerated for about 4-5 days. The longer the tofu marinates, the more flavor it will soak up. I find 30 minutes works great, otherwise it can also be a great dish to prepare in the morning for later in the day. If you’re around, stir it occasionally to make sure it’s evenly marinated. 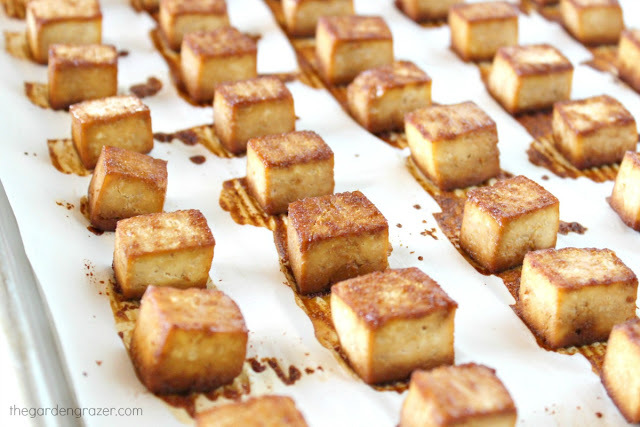 Baked tofu also freezes well!